I haven't done one of these posts for ages as the products hadn't really changed all too much but thought I'd do one now. Please excuse how messy the last cupboard is and how you can't really see what anything is. 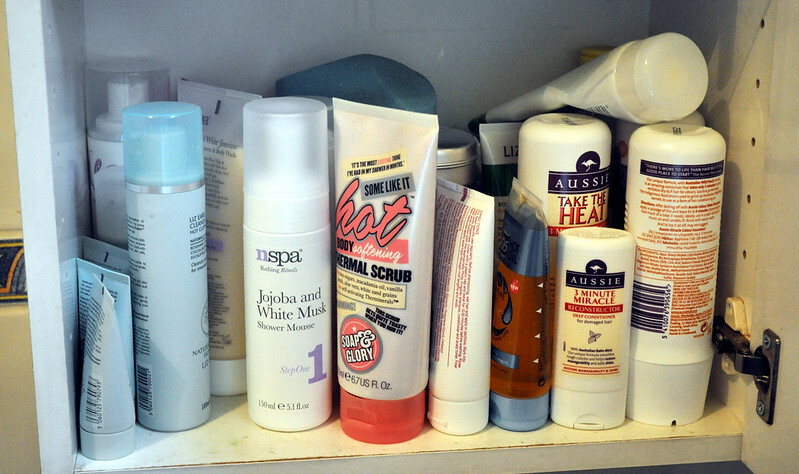 It's mainly full of hair stuff and a few body/skin stuff which are all the same size so you can't really tell the difference between products. I have listed them though so you should at least be able to read what's in it. I have reviews for quite a few of these products so I've linked them if you want to know more about a product. If I haven't written a review but you'd like one let me know in the comments. 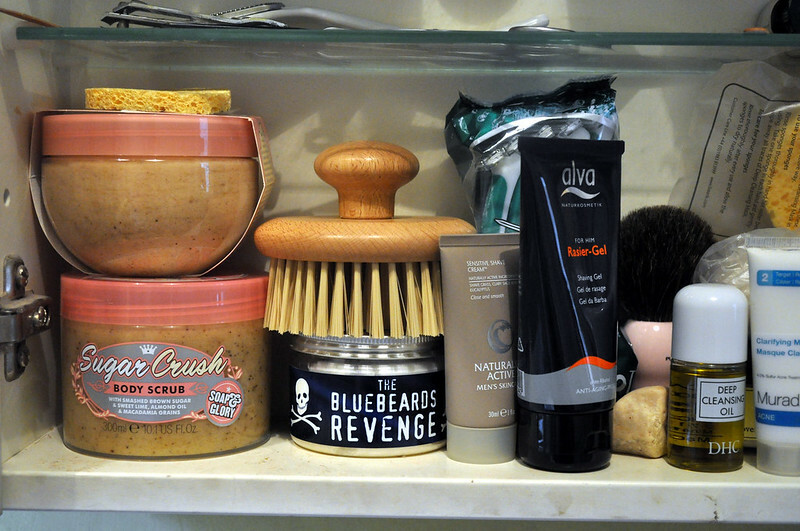 Soap & Glory Breakfast Scrub // Soap & Glory Sugar Crush body scrub // The Body Shop body brush // Bluebeards Revenge shaving cream // Razors // Liz Earle Shave Cream // Alva shave gel* // Bluebeards Revenge shaving brush // DHC Cleansing Oil // Lush Pop In The Bath bubble bar. Murad clay mask // Queen eye make-up remover* // Ahava clay mask* // Liz Earle sponges // Liz Earle clay mask // Lush massage bars // Etat Pur clay mask // Lush It's Raining Men shower gel // Liz Earle shower gel // Liz Earle hand wash // Nspa soap // Depotted shower gel sample. 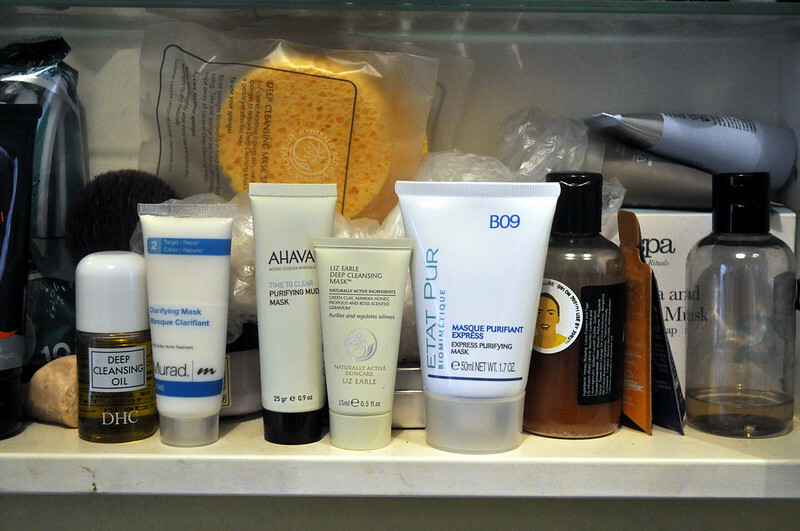 I also have products sitting on my bath which I haven't photographed. Currently there's Nspa grapefruit and passion fruit shower gels, Nspa body scrub and a cheapy bubble bath.